There’s no denying it – we think curved displays look beautiful. Developing products that are aesthetically pleasing without compromising on functionality is a key aim of any designer, and our OLCD technology is an ideal working material. Products that have borderless displays with curved edges, and are unbreakable can be appealing to look at even when turned off. We’ve developed our displays to be thin and virtually unbreakable – they can even be created to incorporate apertures or holes to support novel product designs. So what might this mean for the home of the future? Choose a surface or object in a room in your home. – for example a coffee machine. Now imagine if the curved surfaces of these devices were transformed into screens and integrated with sensing technology, enabling unimaginable functionality. At FlexEnable, we like to call this ‘activating surfaces’. 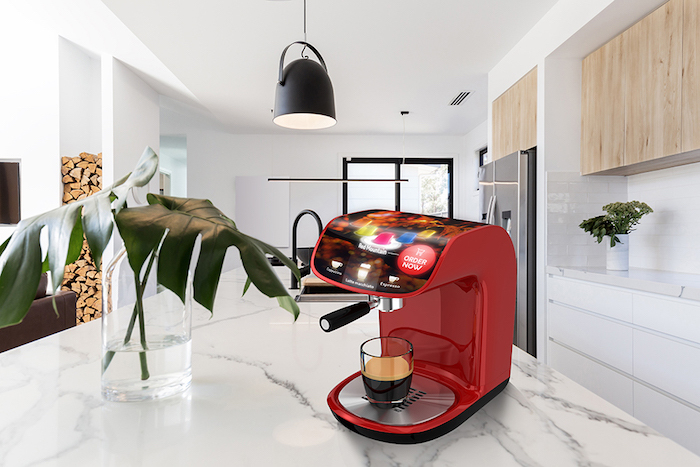 For example, the curved display on your coffee machine could tell you how to make the perfect latte, or simply allow you to customise the ‘skin’ of the machine to suit your preference or your kitchen. These display enabled devices can change the way we interact with machines and make them more user-friendly. You can even consider taking your wardrobe door or floor standing mirror and adding internet connectivity and a camera to create a life-size online shopping experience. You could select your favourite store and ‘try on’ clothes in real time with the display reflecting your appearance back at you. And what about the common lampshade? It could do with a little updating. By replacing its exterior with curved displays, you could have your very own disco light show to complement a house party. Or this might simply solve the problem of having to replace home fittings to match a new colour scheme. Imagine if you could ‘redecorate’ walls, chairs and furniture by selecting the colour you want and letting embedded displays take care of the rest. Being at IFA this year really reflected this vision. There was a lot of focus on the feel, identity and convenience of the future home. A new category called smart displays were being showcased by companies like LG and Lenovo. Smart displays can be touch enabled, respond to voice or relay visual information whether it’s feed from a camera, watching a recipe process in the kitchen or getting make-up/wardrobe tips for a night out. Such devices will be part of the home décor and therefore their design and aesthetics will be an important feature that promotes their adoption. There are numerous opportunities for designers and product developers to let their imaginations run wild with OLCD. It’s scalable to large, floor-to-ceiling displays, and an established manufacturing supply chain makes it far more affordable than other competing OLED technologies on the market, which are still limited to small screen sizes. OLCD is ready and available for integration into the next generation of products and devices, and we’re excited to see what you do with it. Whatever the look and feel of the smart home of the future, we think it only makes sense to imagine a world with fewer corners, fewer flat displays and a lot more curves.